This Is Nuts! Heist Nabs $400,000 Worth Of Walnuts : The Two-Way It's the latest in a wave of "nut jobs" in California's Central Valley that local reporter Rich Paloma believes are linked to organized crime. A walnut orchard in California's Central Valley. 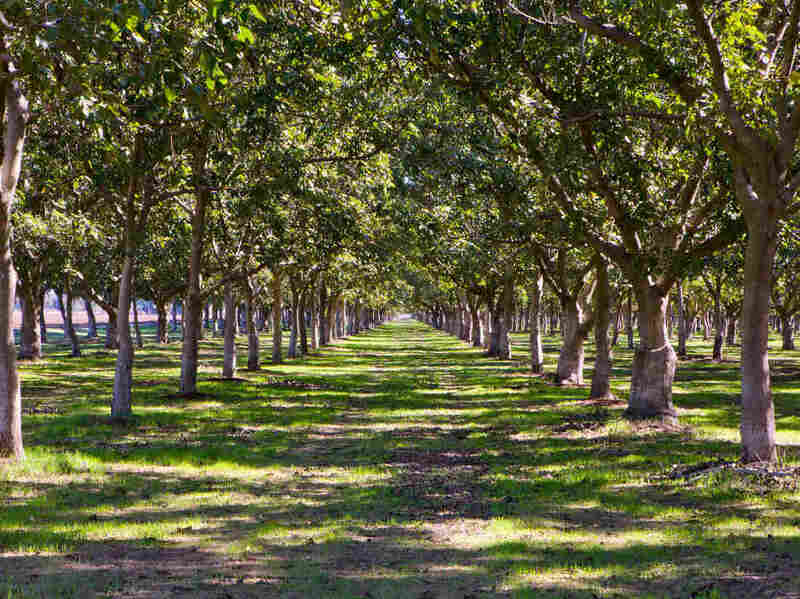 This case is proving a tough nut to crack: Thieves have been making off with shipments of walnuts and almonds in California's Central Valley. The latest heist is valued at $400,000. Rich Paloma, a reporter with The Oakdale Leader, tells NPR's All Things Considered that in the most recent nut job — he's counted six thefts of walnuts and almond shipments in recent months — the thieves cut through a fence. "The walnuts were in three double-trailer sets ... apparently the suspect or suspects hooked up their own tractor to [it] and then drove it off through the fence and then onto the nearby highway," Paloma says. CBS Sacramento provides a clue as to why the sudden interest in nuts. It's the price, which has more than tripled in recent years, from 60 cents to $2 a pound. "The theft is getting bad. You'll see more fences going up around fields," Skipp Foppiano, a driver, tells CBS. "It's gotten worse lately because the price of the walnuts is so much higher now." And these aren't just ordinary criminals, says Paloma, who spent 26 years in law enforcement before switching to journalism. He believes they are part of a larger "nut mafia." "From my research, I'm gathering that the person who does this is going to be well-organized and have some connections," he says. "In fact, some of the sources I've contacted indicate that there's an organized crime aspect to this. If you look at how they're taken out, how they are planned, the equipment that is being used, it's going to require some investment." Paloma says in one recent heist in the Bakersfield area, 80,000 pounds of walnuts were taken and a driver was detained. He said the driver told police "he was given instructions from somebody with a heavy Russian accent to drive them to a location in Los Angeles, and just park it and walk away."